Alcohol is widely used and enjoyed in Scotland and is associated with celebration and hospitality. Across the world, alcohol has been an important part of people’s cultures for thousands of years. It must be remembered though that alcohol is basically a mind-altering substance, just like other drugs. In Northern Europe there is a tradition of binge-drinking with an "all or nothing" approach to alcohol. Statistics show that this is becoming an increasing problem in today’s society, costing Scotland over £3.6 billion every year. 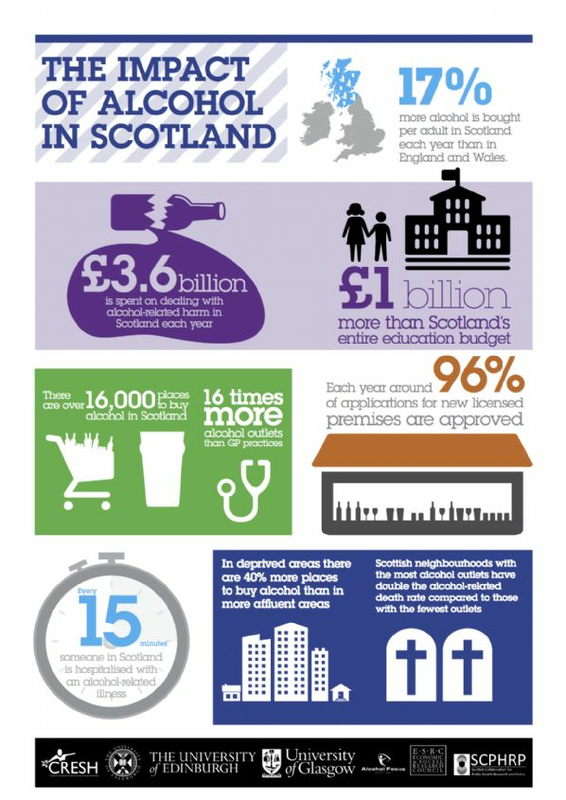 The impact of alcohol in Scotland is highlighted in this infographic produced in 2015 by a collaboration of national agencies and organisations. 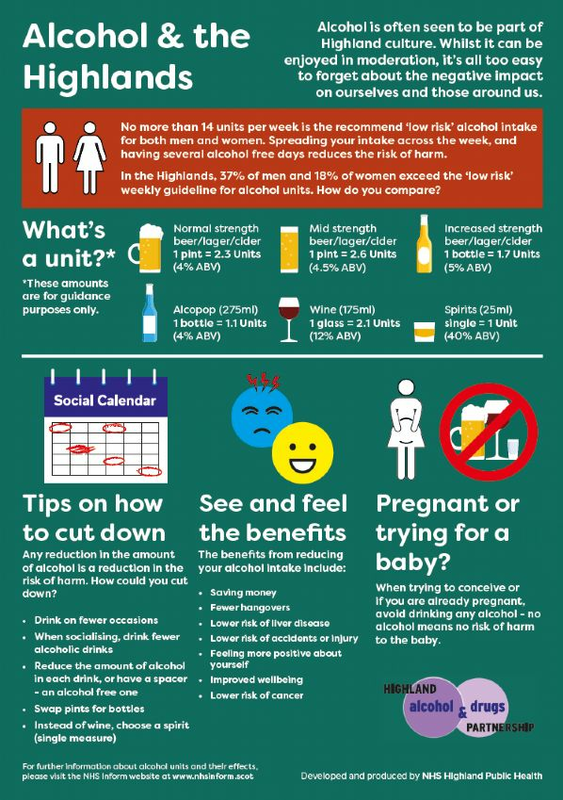 The infographic provides important statistics about alcohol and health in Scotland, including the supply of alcohol. In Scotland, we drink more than people in England and Wales, and more than many other European countries. We also suffer more alcohol-related harm than these countries. Misuse of alcohol can affect many areas of people’s lives, including their health, wellbeing, work, behaviour and relationships. There is no commonly-accepted definition for binge-drinking, but taking more than 8 units for men and 6 units for women on one occasion is regarded as a harmful pattern of drinking. To many this may not seem excessive, but the bottom line is that frequently drinking beyond healthy limits damages your health. Recent evidence establishes a clear link between alcohol and cancer which means there is no amount that a person can drink without there being a risk to their health. The recommended limit for ‘low risk’ drinking is for both men and women not to exceed 14 units per week, ideally spread evenly over three days or more. It is also advised that people try not to drink at all for a couple of days each week. Drinkers should also limit the amount they consume on single occasions, and intersperse drinking alcohol with eating food and drinking water. These recommendations are based on the Chief Medical Officer Low Risk Drinking Guidelines introduced in January 2016. All alcoholic drinks contain units. The number of units in a drink can vary depending on the alcohol content (% ABV) and the size of the bottle or glass. Keep a record - If your drinking is gradually increasing, but you're finding it hard to gauge by how much use a drinks diary to work out what's passing your lips in an average week. Get hydrated - Try alternating your drinks so that you have water or juice in between alcohol. Habit forming - If you associate a certain activity, such as watching TV, with having a drink, listen to your favourite album instead, or cook yourself a nicer meal with the money saved from the wine. Try something new - If you normally reach for a pint after a days work, try going for a walk or join an exercise class. Get money wise - Tot up how much money you have spent on alcohol in the previous week or month. Work out how much you could save by cutting back and choose a gift for yourself as an incentive. Don't drink on an empty stomach - Wait until you've started eating your evening meal before drinking your wine or beer, or have a few nibbles beforehand to slow down the effects of alcohol on your body. Slow down - Recognise when you're drinking too quickly. Sometimes, you might just be. Sometimes you may just be thirsty rather than really wanting an alcoholic drink.